Reusable Alternatives to Paper Products? Yes, please! In an effort over the years to save money at the grocery store and reduce our waste, we’ve found reusable alternatives to many paper products, such as paper towels, paper napkins, storage containers and bags. With those items not on my grocery list, I’ve made more room in my grocery budget for actual food. It’s not hard to make the switch to reusable alternatives and hopefully my tips below will give you some ideas on how you can reduce store bought paper products in your home too. 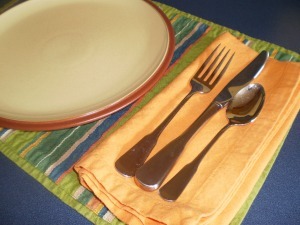 We have been using cloth napkins in place of paper ever since we received them as a wedding gift many years ago. This is an easy switch. To get started, head to the clearance section of any department store and you’ll find plenty to choose from or make your own. When my cloth napkins get too stained to use with company, they move on and become substitute “paper” towels. 2. Paper Towels, Use Reusable Towels or Cloths. For large spills, I use old bath towels that have retired from the bathroom, because they were too old and/or unsightly. For smaller spills, I use old hand towels and cloth napkins. Keep them stored under your sink for easy use. Side note: I use about 1 roll of paper towels in a year. They are nice to have on hand when you have a sick child that couldn’t quite make it to the bathroom in time. Who really wants to wash that kind of a mess, so I will wipe it up with a paper towel and toss in the trash. But besides those occasions, which fortunately are rare, this is an easy switch to make. Flannel is so much softer on my kids’ little noses, so I use flannel hankies during sniffle season. 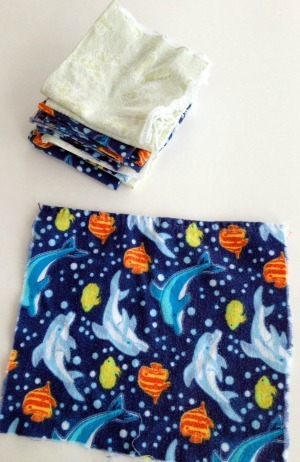 Just cut up old flannel blankets or shirts and a quick stitch around the edges should prevent fraying. 4. Parchment Paper, Use Silicone Baking Mats. I have been using a Silpat Nonstick Silicone Baking Mat for years. There is an initial investment, but parchment paper can be pricey and your investment will eventually pay for itself. Look for sales or use a 20% coupon at Bed, Bath & Beyond. 5. Plastic Wrap or Aluminum Foil, Use Re-Usable Containers. 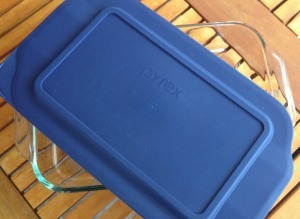 I love my Pyrex Glass Storage Containers with the plastic lids for storing leftovers. I have many different shapes and sizes. They are microwavable (except for the lid) and dishwasher safe. There is an initial investment, but I have seen these containers at yard sales or thrift stores and at Bed Bath and Beyond where they regularly offer 20% coupons. 6. Small trash bags, Use Plastic Store Bags. Even though we try to use cloth grocery bags, we still end up with some plastic, so use them for your garbage. 7. 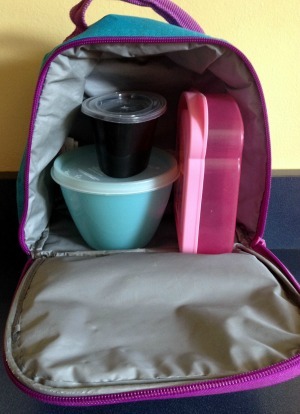 Sandwich & Snack Bags, Use Re-Usable Containers in Your Lunch Tote. 8. Disposable Cleaning Supplies, Use Old T-shirts, Towels, Flannel or Micro-Fiber. 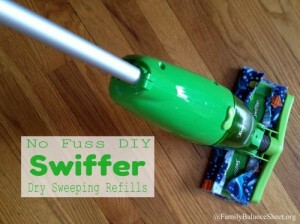 I love my Swiffer, but I don’t like the disposable refills, so I came up with my own No-Fuss DIY Swiffer Dry Sweeper Refills. 9. Paper Plates, Find Cute Alternatives. For picnics, dinners on the patio, and quick lunches, paper plates would be so easy, but cute plastic ware works just as well. 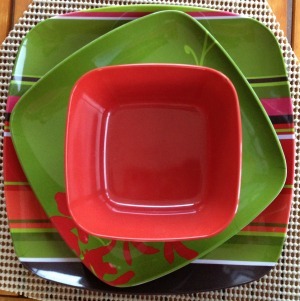 I bought our red & brown plastic ware several years ago at Kohl’s for 60% off and they are awesome for dinners and small family gatherings on our patio. I found the compartment plates at a yard sale for a couple of bucks and they are great for picnics. Side note: When I’m expecting a big crowd (20-30) for a family get-together (which might be once a year), I’ll use paper plates, but as a general everyday rule, nix the paper plates! 10. Plastic Storage Ware, Re-Use Glass Jars Instead. 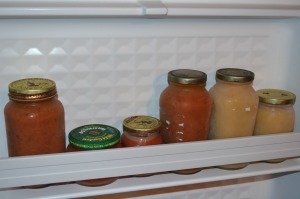 I re-use glass marinara sauce and salsa jars for my homemade chicken stock , my Roasted Roma Tomato Sauce, and my homemade sugar-free applesauce to store in the freezer. You MUST leave about two inches open at the top, because of expansion from freezing. The jars will crack if they are too full when put in the freezer. I also re-use plastic containers that we get with Thai take-out although I know re-using plastic can be a controversial concept for some people. When using plastic containers, I hand wash and I don’t put in the microwave. It doesn’t take much effort to find products that are re-usable in place of disposables, and it’s an easy way to reduce your grocery spending and waste. 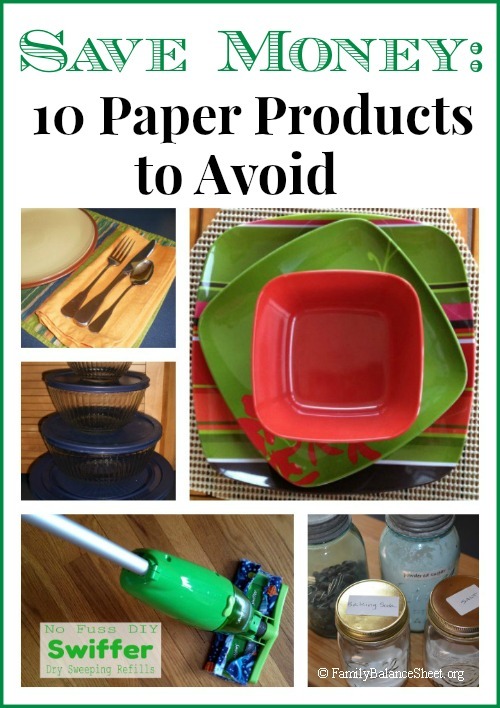 What paper products do you avoid and what did you substitute them with? Let us know in the comments. I think garbage bags are the only one we couldn’t give up. I use the re-useable grocery bags and the rare plastic ones I get go to cat litter. However, we only go through one bag a week. I would go through fewer if I could get a good composting system going. I didn’t compost anything over the winter. I’ll have to take it back up now that my back yard isn’t covered in snow. We have cut back on our paper towel use since I have a box of rags to use in the kitchen now. It wasn’t as hard to switch to the rags as I thought it might be. We are fortunate in our area we have curbside yard debris and food scrap pick up, plus curbside recycling. It was hard to get used to at first but now I really like it. WOW, Shelly, curbside food scrap pick up? We have yard debris pickup/recycling, but I’ve never heard of food scrap pick up. I’m curious what part of the country you live in?? That hasn’t hit central PA yet. Although backyard composting is encouraged. I love all the tips, but I’m having a hard time getting rid of paper towels. Mainly because I can’t stand the smell that cloth towels get after wiping the counters. I go through cloth towels to fast and run out before my next washing. Would love suggestions. I keep a small basket on top of my dryer for all of my dirty kitchen towels, dish clothes, and cleaning rags. I run small loads every few days, because I don’t like wet towels sitting for too long. To help with the smell, I add baking soda to the machine along with the detergent and I honestly don’t have a problem with smell. Hope this helps. What about aluminum foil? I use it to cook a lot ? That’s a good question! I try to limit my use of it, but I know people who clean it after use and re-use. How do you use it to cook? That might help us with solutions. Thank you SO much for the awesome ideas! The one that I haddn’t thought of was the Silpat! duh! I get those %20 coupons from Bed Bath and Beyond, too-bonus! We nixed cloth napkins and paper towels a while ago and I keep copious amounts of rags in a trash can in the laundry room. There is a site on Pinterest that shows how to make “Not” Paper Towels. (I’m sorry, I don’t know how to add those “link-thingys). She made hers REALLY fancy, but I just went and got a couple of yards of cheap muslin, doubled them and made my own. I keep them in a basket on the counter and the guys love them (which happily suprized me!). I love those 20% BB & B coupons. They come in handy. Thanks, Holly, for reading and taking the time to comment. I will have to search for the “Not” Paper Towels on Pinterest for some ideas.